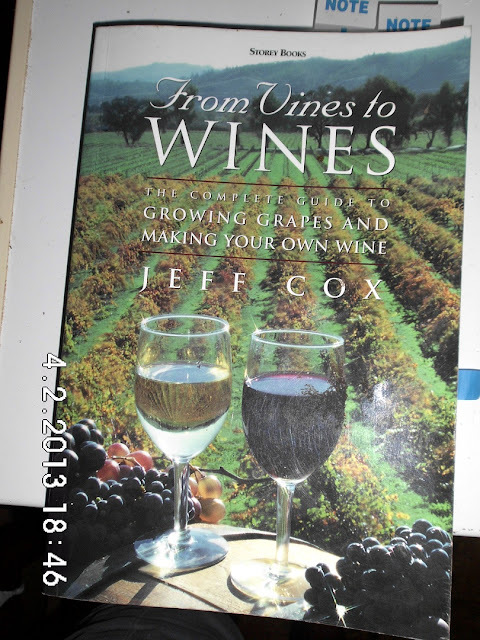 Jeff Cox in his book ”From Vines to Wines” talks about keeping the skins in the must until they fall to the bottom of the fermenter and then pressing. The total time on skins is 22 to 28 days although he says 28 is the outer limit, 20 the minimum and 24 ideal. The extended skin contact affects the chemical makeup of the tannins softening them. He pumps CO2 over the must under a plastic cover from when the fermentation slows and has appeared to stop. Rather than buy CO2 I’ve put an airlock on the fermenters as they near the end of fermentation. Every day or two I have taken out the header boards and given the must a solid plunging just to make sure all the grape sugar is being worked on by the yeast. The current plan is to wait until the fermentation has ceased and chill the must again until the skins fall then press while it is cold. I plunged and stirred the reds this morning and noticed the colour is getting more intense and staining my hands.